Author’s Note: This article was updated September 24 and 28, 2015 to add new information. 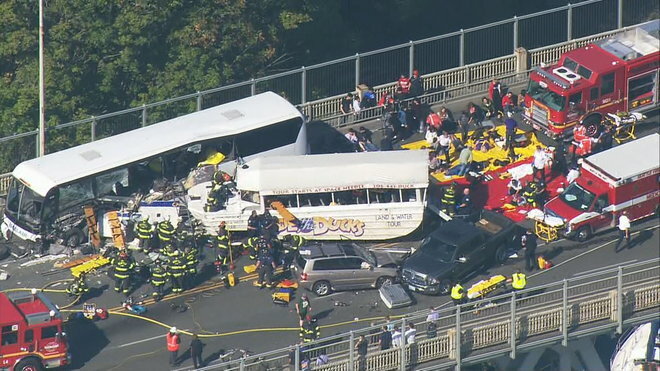 On Thursday morning a tragic crash on Seattle’s Aurora Bridge between an amphibious Ride The Ducks tour vehicle and a charter bus left at least five people dead and 52 people injured. While the investigation is only beginning and many factors could be at play, the design of the bridge is almost certainly a key cause of the crash. 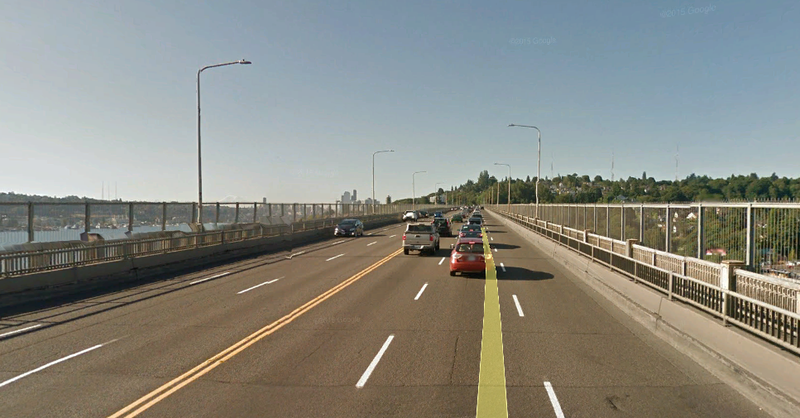 The Aurora Bridge must be redesigned to address the simple but critical safety issues of lane width and speed. Officially named the George Washington Memorial Bridge, the bridge that carries Aurora Avenue opened in 1932. It’s 70 feet wide, nearly 3,000 feet long, and carries six lanes of traffic on Washington State Route 99. I am a frequent advocate for urban lane widths less than the rural highway standard of 12 feet (which is WSDOT’s preference); down to 10 feet is ideal for city streets, but 11 feet is fine for routes frequented by buses and heavy trucks. Anything less than 10 feet at highway speeds is dangerous. Additionally, roadways with more lanes encourage drivers to break posted speed limits. Early eyewitness reports indicate the two vehicles were traveling in opposing directions before the crash, although it is unclear what lanes they were in. One rumor is the Duck vehicle blew a tire. Regardless, with the opposing lanes only 9.5 feet wide, other lanes as narrow as 9 feet, and without a central barrier on this high volume, high speed roadway, the type of collision that happened Thursday morning was inevitable. The fact that both vehicles involved were wide (buses are 8 to 9 feet wide) multiple-passenger vehicles compounded the chance and horror of this collision. I’ve been considering making this post for some time, but today it is suddenly and unfortunately relevant. The solution to preventing this from happening again is simple: rechannelize the lanes on the bridge and add a central barrier like the rest of Aurora Avenue. 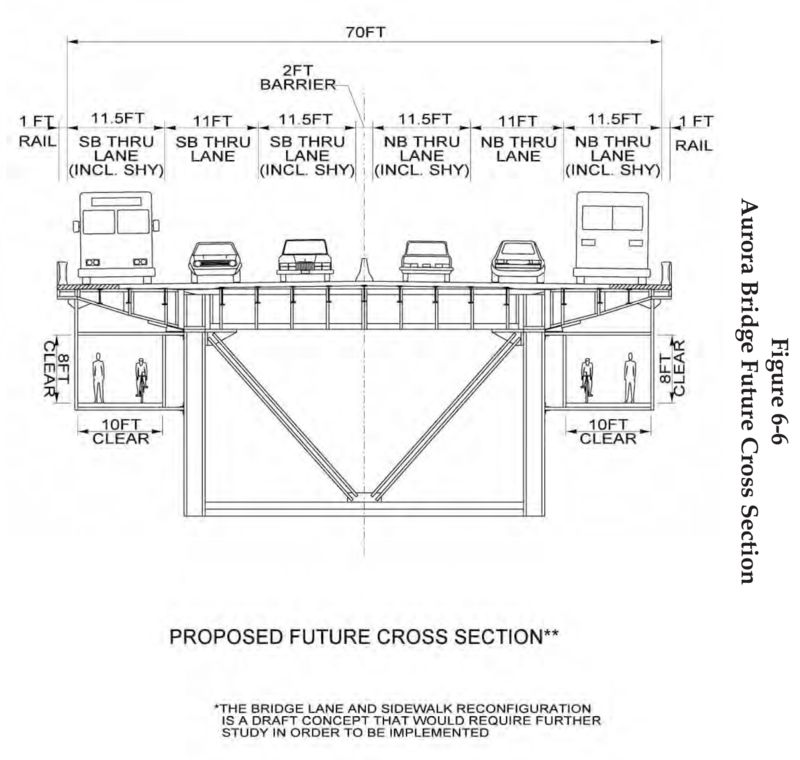 The resulting extra space must be used to widen the bridge’s sidewalks for safe passage by people walking and bicycling, and could also be used to provide a wider median than proposed. A best guess of the current design and one possible redesign is illustrated below. Other possible solutions are to channel the roadway into five lanes, with the center lane being reversible based on traffic flows using signals or a movable median barrier. This is what is done on the Golden Gate Bridge in San Francisco (see this video of how it works) and the three-lane Lions Gate Bridge in Vancouver, B.C. The study suggests, “The proposed bridge improvement (Figure 6-6) would widen the lanes from 9.5 feet to 11.5 feet for the curb and inside lane and 11 feet the middle lane. A median barrier would be added to the bridge and approaches, and would connect to the existing barriers at the N. 38th Street and the Halladay Street intersections. 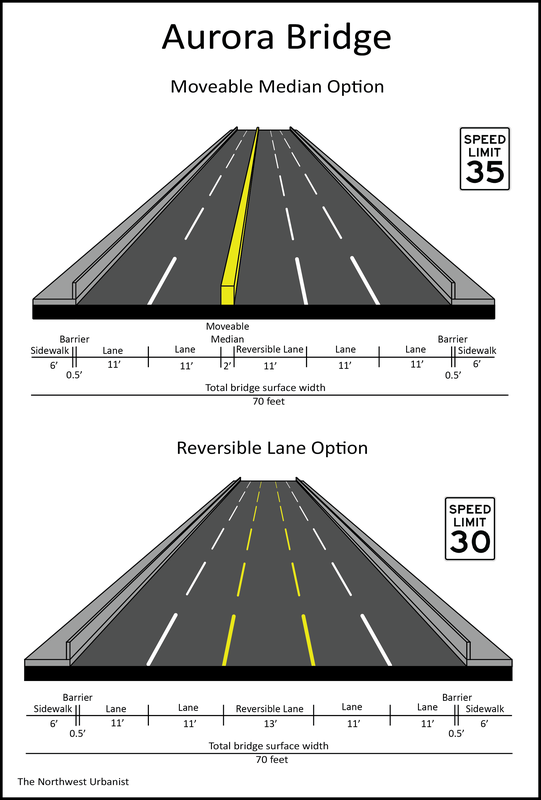 The proposed additional lane widths and median barrier would require relocating the sidewalks below the bridge deck. In addition, the sidewalks would be widened to 10 feet to provide for multiple users and non-motorized vehicles.” The Seattle Times reports that Washington state lawmakers did not provide any funding to pursue these changes. Issues of traffic congestion and cost are insignificant compared to the potential and realized loss of life on this bridge. The state has shown a willingness to improve the bridge already; in 2011, a $4.8 million suicide barrier was built along the edges of the bridge. In the long term, the Aurora Bridge likely needs to be expensively retrofitted or completely rebuilt (which the WSDOT study estimates would cost $200 million in 2003 dollars). It is over 80 years old and functionally obsolete. A safety redesign will fulfill Seattle’s Vision Zero strategy for eliminating traffic deaths and serious injuries by 2030. Reconfiguring the Aurora Bridge will be one of many big steps towards improving traffic safety in Seattle. Local and state leaders must act now to prevent today’s tragedy from happening again. This entry was posted in Editorial, Roads, Transportation and tagged Aurora Bridge, barrier, bus, channelization, collision, crash, design, fatalities, George Washington Memorial Bridge, injuries, killed, lane width, median, redesign, Ride the Ducks, road diet, safety, sidewalks, speed, traffic. Bookmark the permalink. I completely agree that design needs to change. Even though it would mean more congestion merging six lanes into four, isn’t that worth the life of even one person? This isn’t the operative logic of transit design. If that statement were true, we simply would never drive cars. The six to four lane reduction isn’t even that big of an issue if you consider the outermost lanes sound of the bridge are basically transit and turn only lanes. Aurora basically is four lanes south of the zoo anyway, so this redesign is a fantastic idea. But why reduce to two lanes when you can easily have three in the peak direction with the same safety benefit? The next earthquake will remove the bridge so a new one will be built. 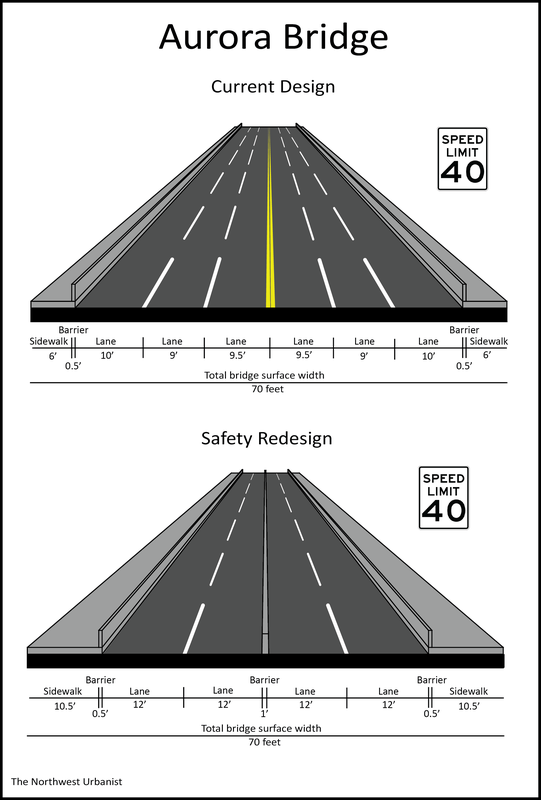 A median is pointless because it will only affect the bridge. There are longer sections of 99 that have the same problem. The lanes are fine at the posted speed. The median is a good idea due to the reduction of head on collisions but it won’t do anything about vehicle collisions altogether. More enforcement of the speed limit is needed. Going 40 mph on that bridge isn’t that bad. It’s when you have people going 50-60 or faster is when it becomes more dangerous to everyone. Moveable median (e.g., by Zipper truck) with 5 restripped lanes is the best option. It could be extended beyond the bride if necessary. No reason not to do it.